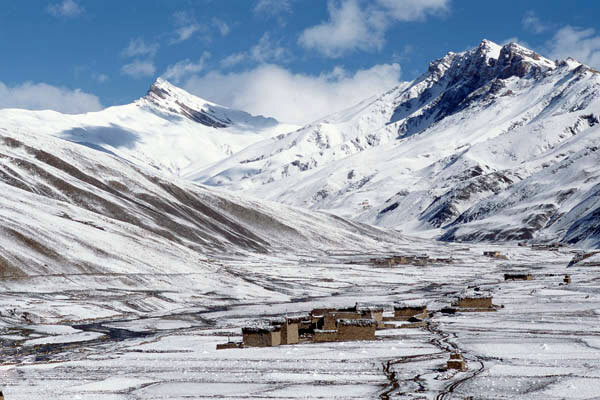 Upper (or Inner) Dolpo is a restricted area requiring expensive permits, but to trek in southern Lower Dolpo the permits are much cheaper. 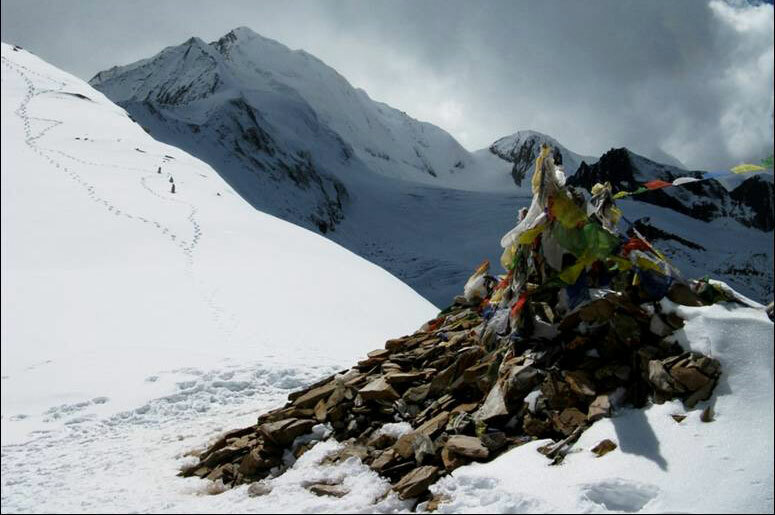 There are numerous treks that can be done and the trek that we recommend combines the beauty of the area with high quality trekking. 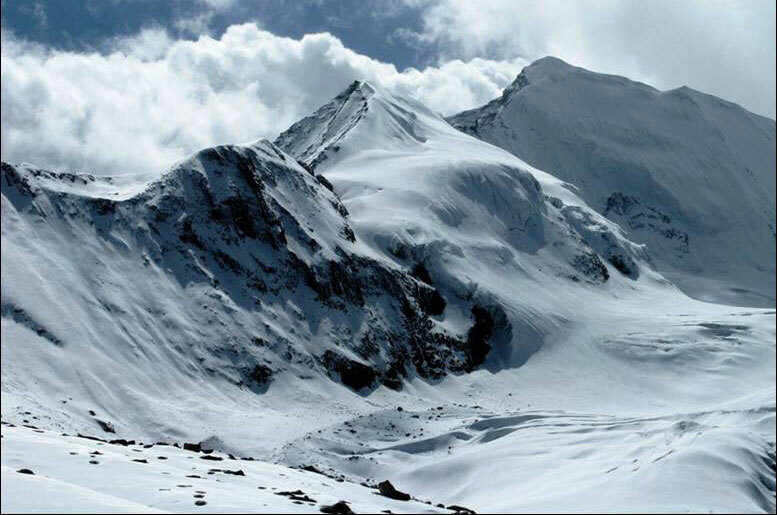 Much of this trans-Himalayan trek is within the Shey Phoksundo National Park (SPNP), Nepal’s largest national park at 3,555 sq km. 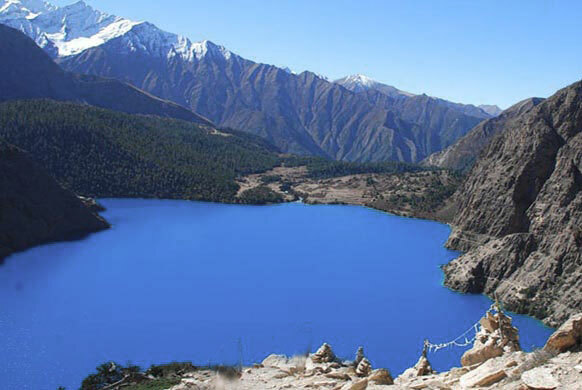 The trek goes over three high passes, the Kagmara La (5,115m), Baga La (5,090m) and Numa La (5,360m), skirts the deep-blue, tranquil and holy Phoksundo Lake (3,660m), Nepal’s deepest and second largest, and ends at Juphal after descending the gorge-side path of the Tarap Khola. NB the area is relatively arid and marijuana is a crop, the sweet smell of which permeates the atmosphere in the harvesting months of September and October. A reasonably fit person can do this camping trek anytime from mid-May to October. It can be done during the monsoon (June to September) as Dolpo lies in the rain shadow area formed by the Dhaulagiri and Annapurna ranges. Late in November to mid-April can be a bit risky as the passes may be covered by snow. Day 2 Nepalgunj via Jumla to Gothi Chaur (2,700m) We fly to Jumla (2,370m) and start trekking through a fertile valley of rice terraces, before hiking up to a small ridge. We are already in wild country as we trek down through a forest of walnuts and maples to a magnificent flower-spangled meadow. 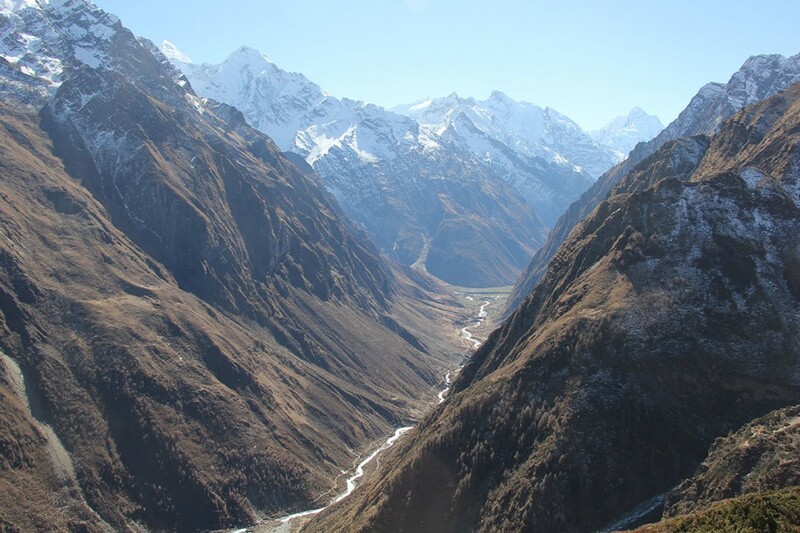 From here we trek up to Pattyata Lagna (2,830m) and can look down into the beautiful verdant Himalayan meadows of Gothi Chaur, a tree-lined pasture strewn with orchids, forget-me-nots and geraniums. We hike down to a spring and make our first camp here. (7 hours trekking). Day 3 Gothi Chaur to Naphukana (3,080m) We trek downstream to the confluence of the Kuri Sangta and Bapila Kholas (rivers) and hike upstream along the Bapila Khola to Muni Sangu, where we will start to see carved wooden effigies, known as dokpa, on the houses. 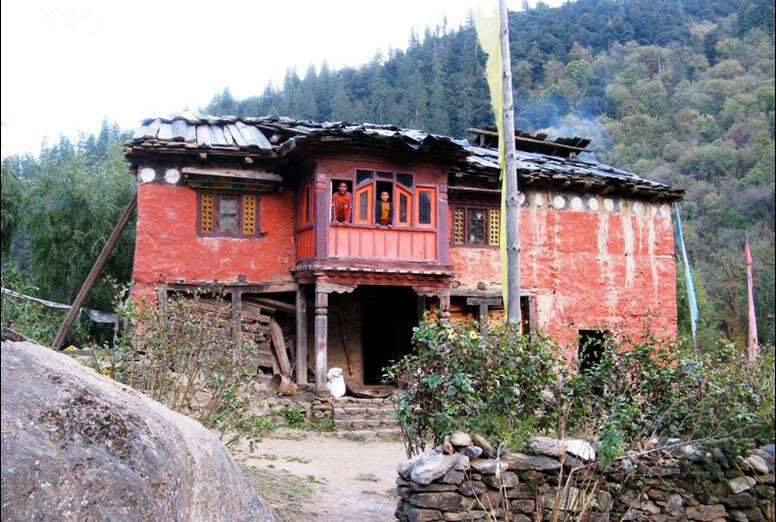 Dokpas proliferate in Dolpo and are there to ward off evil spirits. 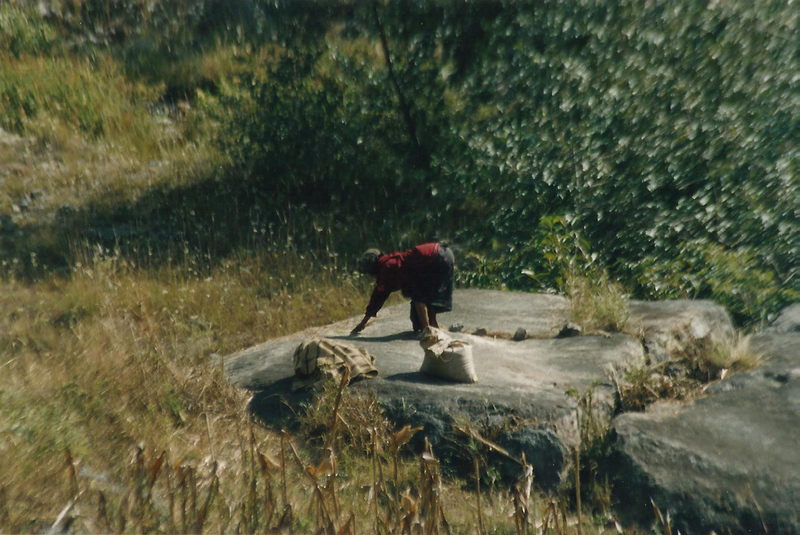 We trek through forests of oak, spruce, poplar and maple and then hike up to the village of Chotra. 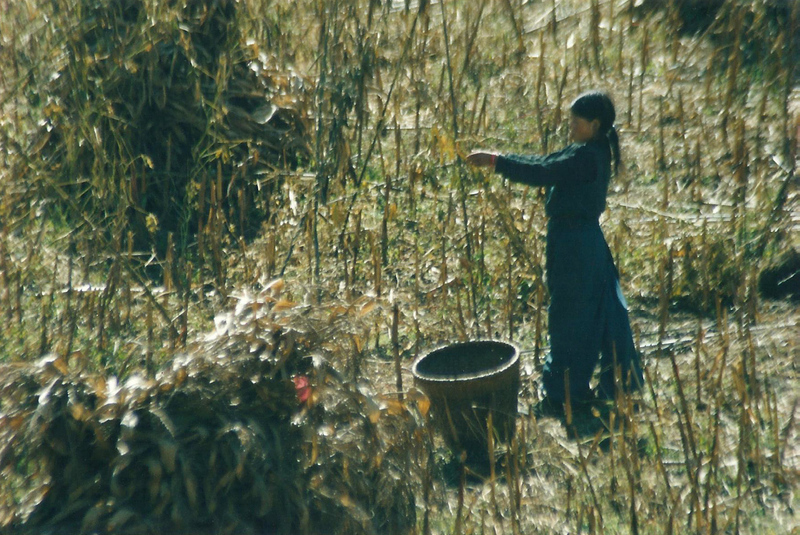 The people here are Khampas from eastern Tibet, though they long ago adopted Hindu traditions if not their religion, using shamans and have a major deity named Masta. 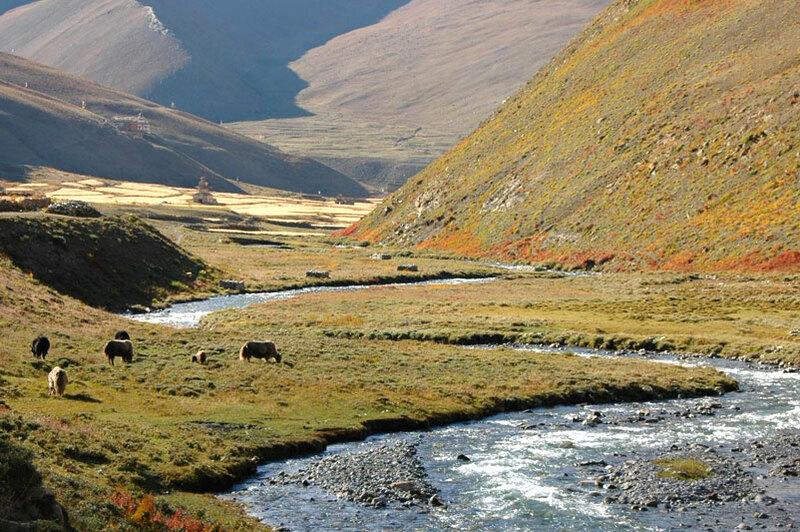 From Chotra it’s a short distance to Naphukana, with its yaks and horses, where we camp. (8 hour trek). Day 4 Naphukana to Chaurikot (3,060m) We trek gently up through forests of oak and birch before hiking across the Tila Khola. We then trek up through more forests, of oak, birch and rhododendron, and a floral meadow to Mauri Lagna (Honey Pass) (3,820m) with its wonderful views. 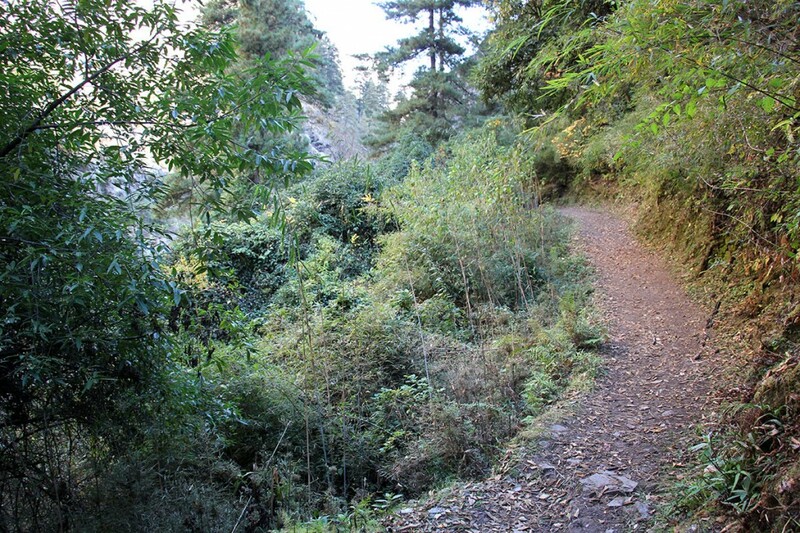 We trek down to a long traverse and then hike down sharply through pine and oak, before trekking back up to a ridge which we follow, with excursions, to the Khampa village of Chaurikot. (6 hour trek). Day 5 Chaurikot to Bheri Khola (2,610) We trek across a couple of ridges, hike down to a stream, trek up through a walnut forest to another ridge, past corn, rice and the apple orchards of Jyakot then hike down through Rimi and Majagoan to the Bheri Khola and Kaigaon – a village with a shop! We camp near here. Aside from walnuts you may notice the sweet fragrance of marijuana as this is heavily cultivated in the area. (5 hour trek). Day 6 Bheri Khola to Garpung Khola (2,900m) We trek through the charming old village of Hurikot, site of the most important Bon gompa in the district, and enter the Shey Phoksundo National Park. The going gets a bit harder here. 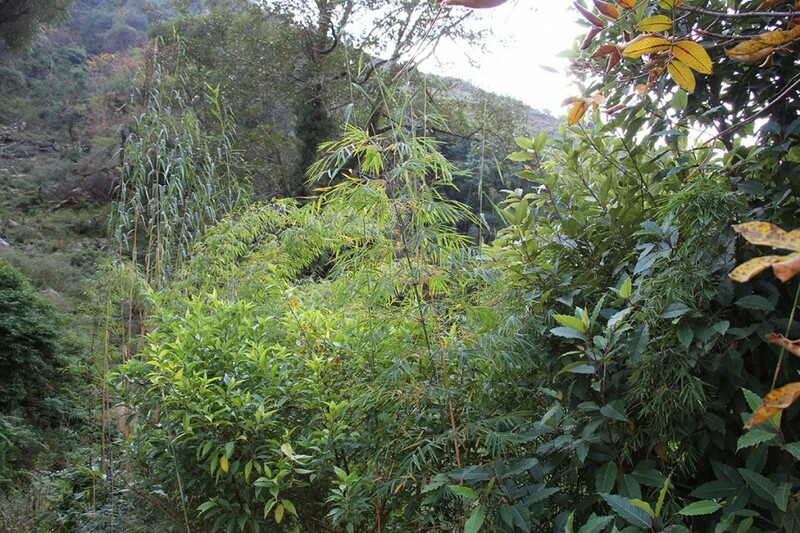 We hike up, traverse and make a precipitous trek down to the Jagdula Khola and the village of Toijem, where the police post garden contains a choice selection of marijuana plants. We camp near here. (3 hour trek). Day 7 Garpung Khola to Kagmara (3,500m) We trek along the river upstream and, to avoid any altitude problems, camp at Kagmara. (5 hour trek). 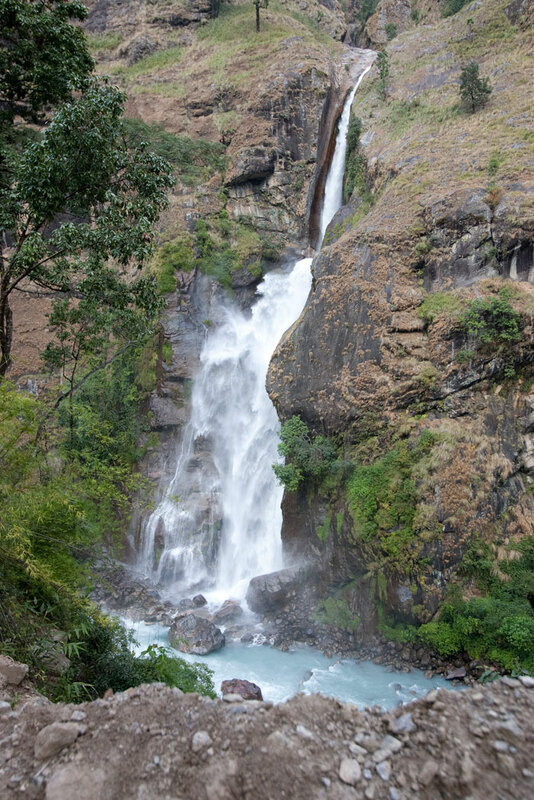 Day 8 Kagmara to Kagmara Phedi (4,000m) We trek on up the valley as the stream narrows and starts to cascade. We camp among the boulders, blue poppies, buttercups, mint, gentians, puffballs and, no doubt, stray marijuana plants. Here we should see snow pigeon, redstart, raven and griffon, it is also a good place to see blue sheep. From here you can hike cross the Jagdula Khola and trek up to a grass ridge to the west for great views of the Kagmra Himal. (3 hour trek). Day 9 Kagmara Phedi via Kagmara La (5,115m) to Lasa (4,060m) The wall above you might look formidable but in reality it’s an easy zigzag alongside the Kagmara Glacier to the pass. From here it’s a must to make a short hike to the ridge (5,380m) directly to the north of the pass, from here the views of Kagmara, Kanjiroba, Dhaulagiri, Annapurna and dozens of other peaks are stupendous. 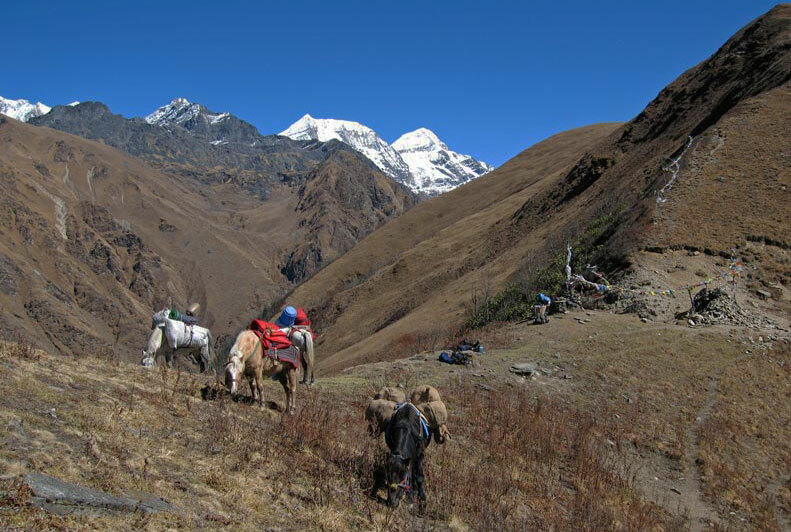 We trek down for about an hour toward the pastures of the Pungmo Valley and then camp. Now we’re in the real Dolpo! (5 hour trek). Day 10 Lasa to Pungmo (3,100m) The trek stays high above the stream as we hike down through birch and juniper and then blue pine forests to the fortress-like village of Pungmo with an interesting Bonpo gompa and apple orchards. For anyone specially interested in the Bon religion an hour’s trek up river brings one to Thekchen Rabgyeling Gompa. (6 hour trek). Day 11 Pungmo to Phoksundo Lake (3,620m) We trek past the confluence of the Suli Gaad and Pungmo Khola and the deserted village of Sumduwa. A little further on, near the Jharana Hotel, is Gangchhen Menkhang, a traditional medicine clinic run by a traditional healer. We trek up through a forest of cedars to Palam (3,280m), a sandy winter settlement for people from Ringmo. We trek up a ridge, passing prayer flags marking a 200m waterfall, Nepal’s highest, and get our first views of Phoksundo Lake. We hike down through forests of birch and chir pine to the picturesque village of Ringmo. From here it’s just a short hike to the lakeside campsite. (5 hour trek). Day 12 Rest Day Time to explore, we can hike to the large crumbling lakeside Thasung Chholing Gompa, a Bon gompa just east of the village. 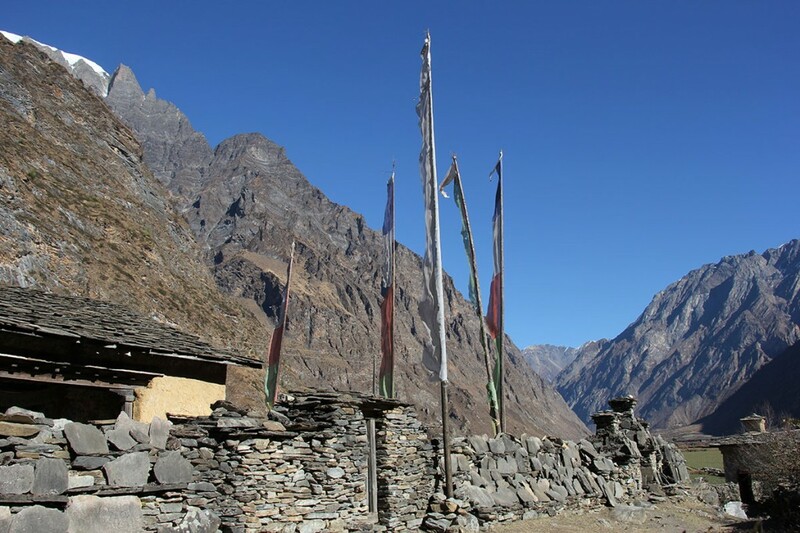 The route toward Shey Gompa is off limits without a permit, but if the checkpoint is unoccupied you can trek to a hidden beach at the base of a glacier falling from 6,612m Kanjeralwa peak. You can also hike up the hill south of the lake. Ask your trekking guide for advice. Day 13 Phoksundo Lake to Baga La Phedi (4,100m) We trek up and traverse through blue pine and juniper, (the last trees you’ll see for a few days), past chortens and prayer flags to Dajok Tang (prayer-flag meadow), our campsite. 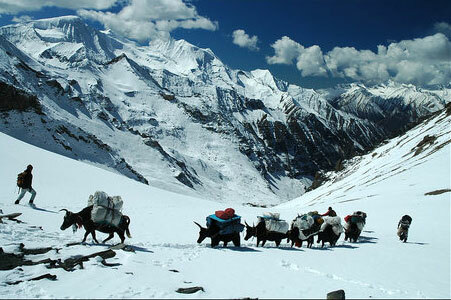 On this trek we may pass yak caravans hauling timber to Do Tarap. (5 hour trek). Day 14 Baga La Phedi via Baga La (5,175m) to Pelung Tang (4,465m) We hike up, not too steeply, rock hop across a couple of streams, trek up a little more steeply until we reach Baga La, a narrow cleft amongst steep rocks. From here we zigzag down to Pelung Tang. 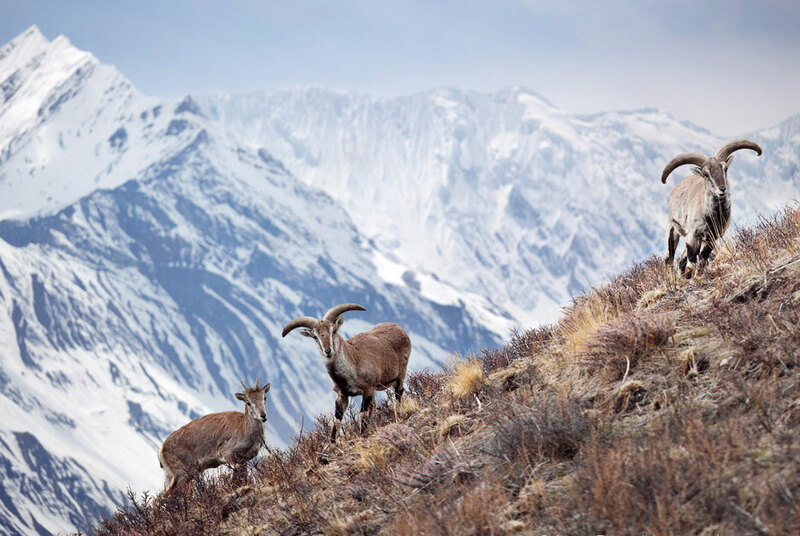 Keep your eyes open for blue sheep, snow leopards have been spotted here too. (5 hour trek provided there’s no heavy snow). Day 15 Pelung Tang via Numa La (5,360m) to Champa Gompa (4,200m) We need to start early for this long, steady, but not hard (unless there’s fresh snow), trek to Numa La. At this pass the views are magnificent, though you should climb 20m to the crest on the left (east) or, better still, hike up Num Ri (5,575m), a small plateau peak to the south, from here you can see to the north the desolate brown hills of Dolpo, to the west Kagmara, Kanjiroba and Humla, to the east the trail to Chharka La and to the south Putha Hiunchuli, the Churen Himal and Dhaulagiri. 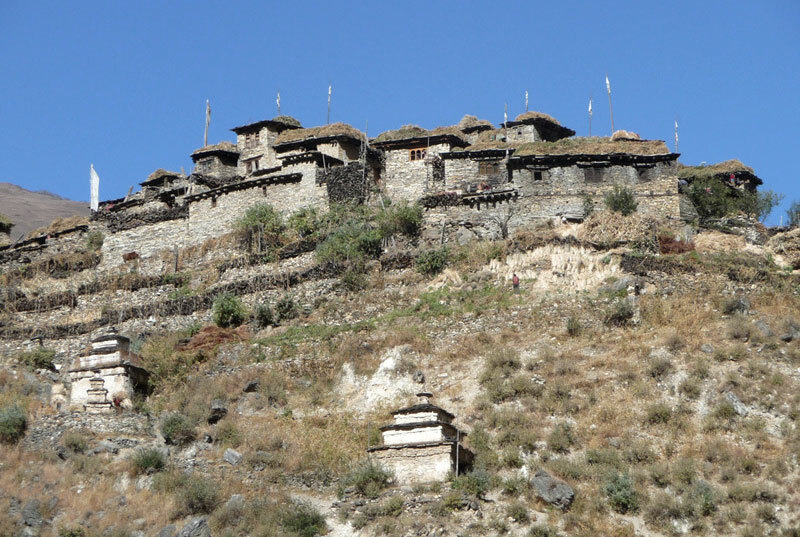 We hike down past a ridge with mani walls and a chorten where a large prayer meeting is held every July. 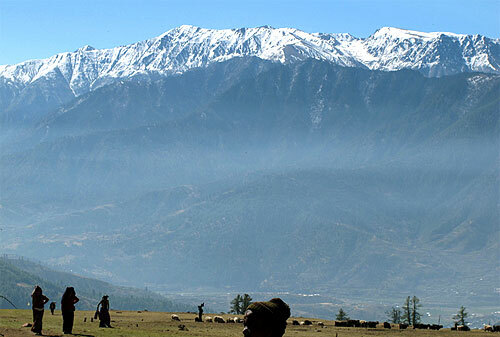 We trek down into this magnificent valley and camp at Champa Gompa. (8 hour trek). 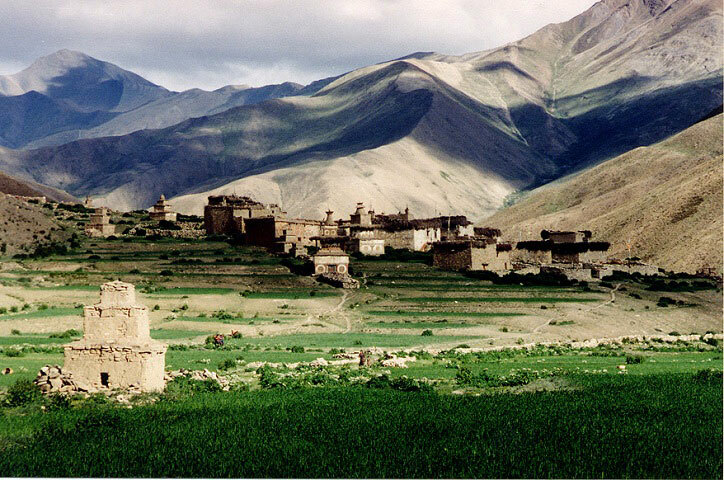 Day 16 Rest Day This is an exploration day, spend it discovering this remote Tibetan valley. You can hike to Gakar and the Dorje Phurba Gompa, to Mekyem Gompa or hike on down to Do Tarap and visit the Ribo Bhumpa Gompa with its chorten containing the remains of a demon killed by Guru Rinpoche, the teacher who brought Buddhism to the Tibetans and is sometimes venerated as a Second Buddha. 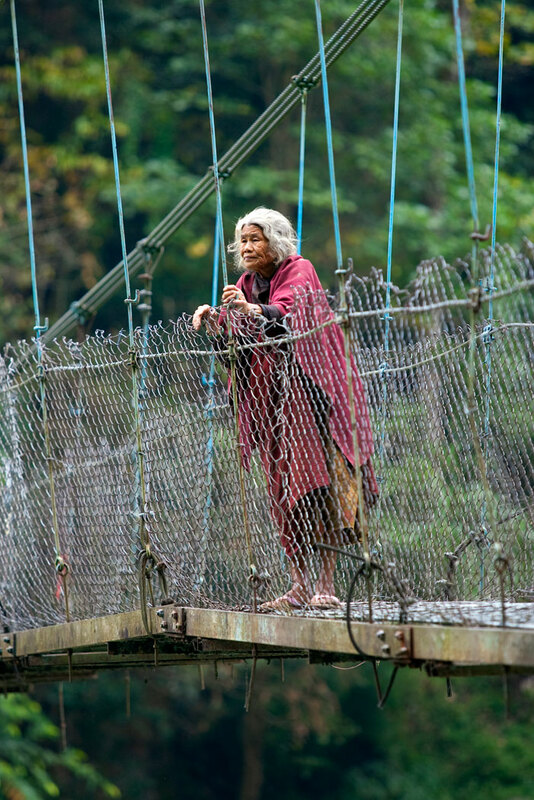 You could spend a ½ day trekking to Doro Chu and Doro and Shipchok Gompas. 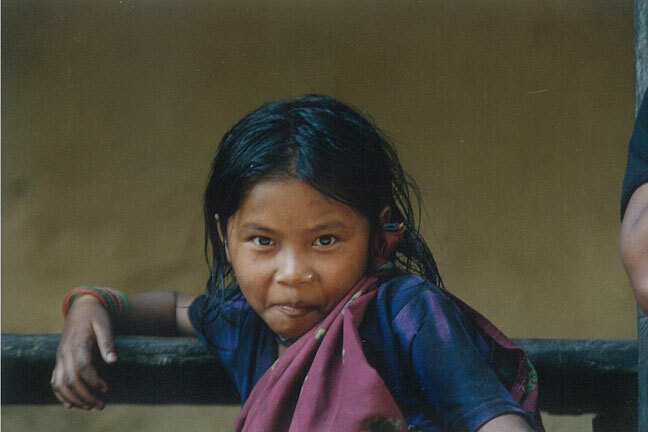 And if you feel gompaed out you could try hiking up the peak to the south of the village or visiting the newly founded Crystal Mountain School, the first attempt to bring education to the region. Meanwhile the crew will move the camp down to Do Tarap (90 mins). 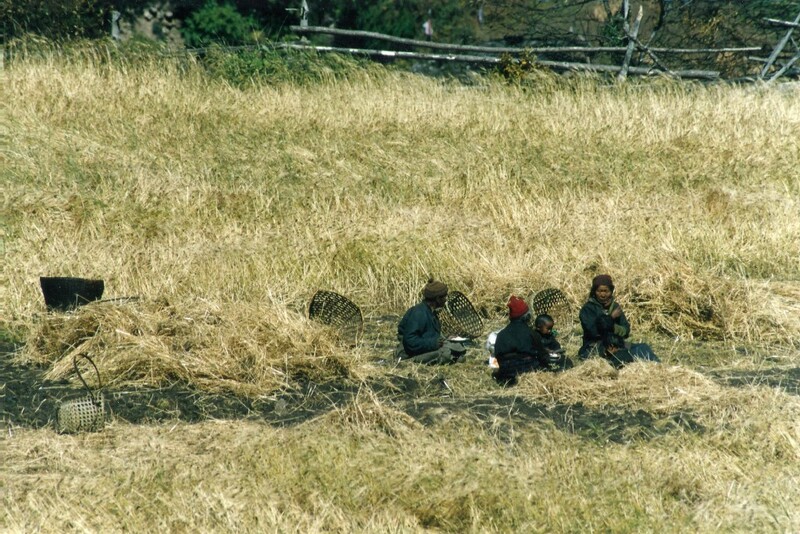 If you’re here in October the locals are out harvesting the barley. Careful of their yaks though, they use the full-blooded variety, not the docile cross-breeds you’re more used to seeing. Day 18 Lahini to Tarakot (2,450) Another gorge! This one widens after a while and we trek into a forest of cedar trees (trees again!). Look out for white-breasted dippers, a bird unique to western Nepal, along the river. If we want we can make a 15 minute detour to Chhandul Gompa. We trek up past cypress trees, staying high above the river before hiking gently through fields of buckwheat to camp just below the old fortress village of Tarakot, pay a quick visit there. (7 hour trek). 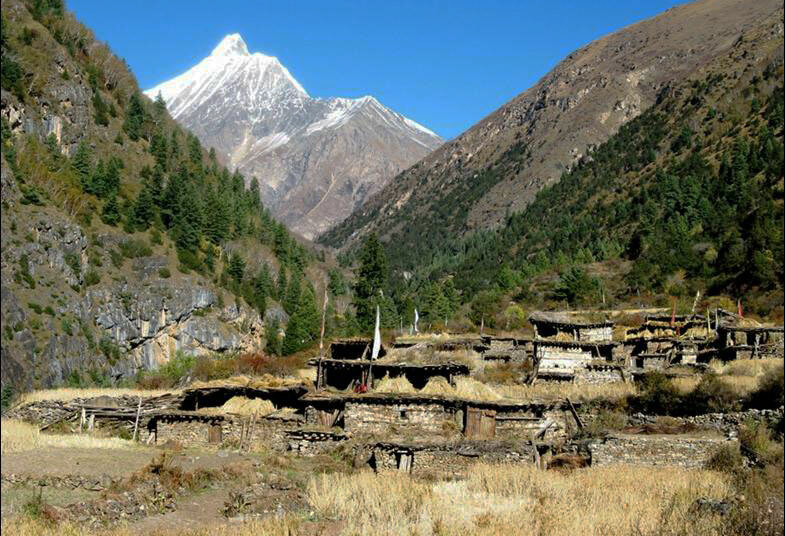 Day 19 Tarakot to Dunai (2,030m) We trek on to the pleasant town of Dunai, capital of Dolpo district. (4 hour trek). Day 20 Dunai to Juphal Airport (2,500m) We now must make one last trek, to the airport – and it’s a 3 hour gruelling up-hill slog! Day 21 Juphal Airport via Nepalgunj Airport to Kathmandu Hold your breath folks as this is Nepal’s shortest STOL (short take-off and landing) strip. As the plane takes off it banks sharply to avoid the huge boulder at the end of the runway! Price US$ 2,400 plus accommodation in Kathmandu. Price includes Airport pick-ups and drop-offs, 1 night in Nepalgunj at a 3-star hotel, all inclusive trek costs; all camping equipment, air tickets, breakfast, lunch, dinner, trekking and park permit fees, flights, guide and necessary porters and all their costs such as transportation, accommodation, food, equipment, insurance etc.